The wall right behind the stall has a graffiti painted with the big words “The Art of 蝦 Noodles”, which literally means “The art of Prawn noodles”. 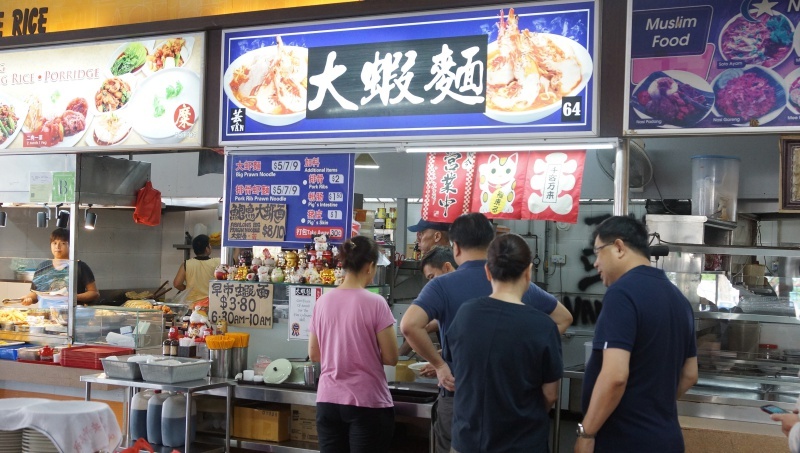 The slogan implicitly showcases the confidence of the chef’s culinary skills for this staple food and the long queues apparently underpins the popularity of the prawn noodles here. 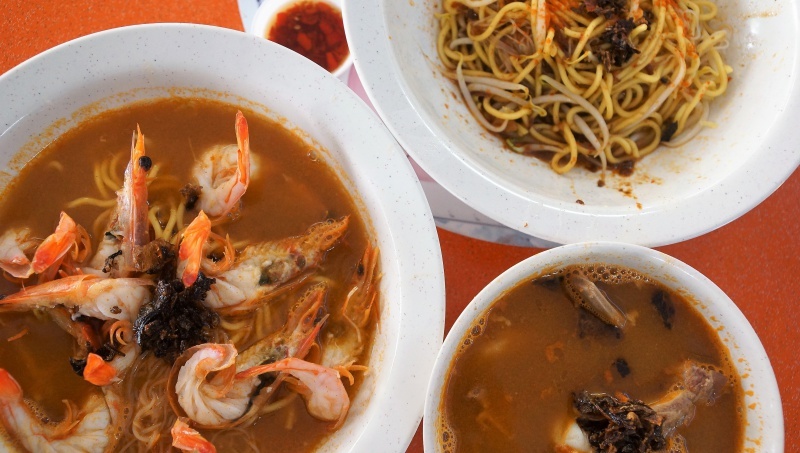 Located deep in the Loyang industrial park and almost right next to the sea, Big Prawn Noodles chose the secluded part of the island to run the business,. The one-man show stall doesn’t have to fear the lack of crowd – the queue is hardly broken throughout the business hours. Operating only for the breakfast and lunch crowd, we went early in the morning around eight plus and queued 20 mins for the noodles. 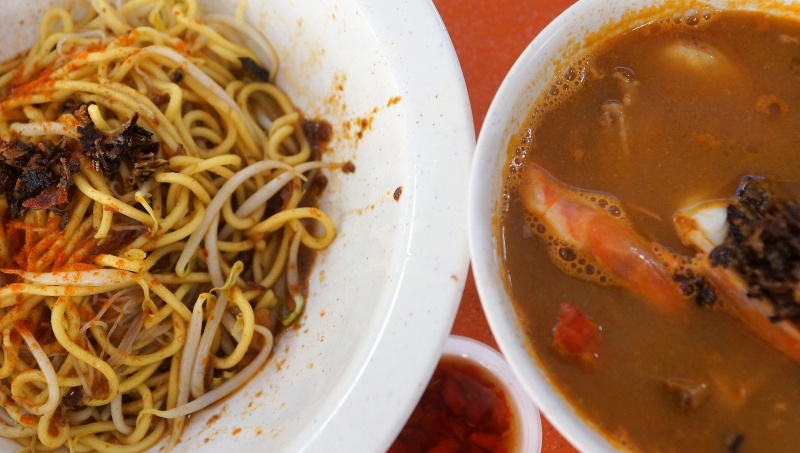 Big Prawn Noodles offers standard prawn mee at $3.80 in between 6.30am to 10am caters mainly for the workers nearby. However, the real Mccoy here is the Big Prawn Noodles & Pork Ribs, and the Prawn Noodles besides the Premium Abalone Prawn Noodles sold at $8/10. We ordered the $7 serving that came with ten half-sliced middle sized prawns and topped with a spoonful of homemade shallot oil. The taste of the soup was flavourful, and has the much needed sweetness and taste of a good prawn noodle. 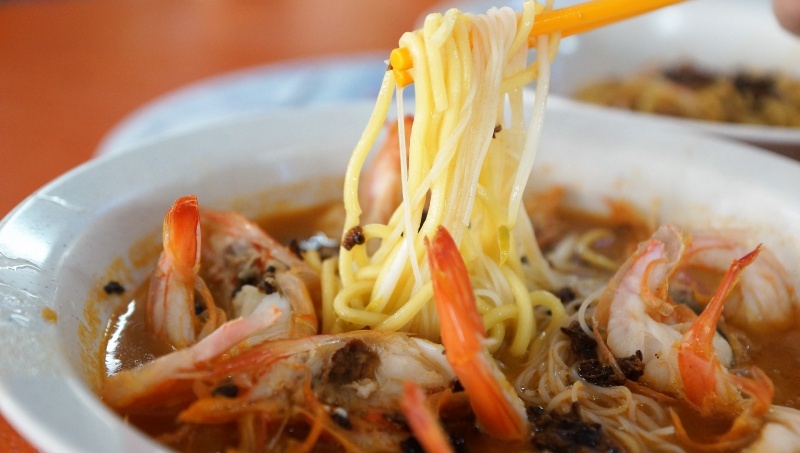 What we loved most about the Big Prawn Noodles is the lack of fishy taste that is found in other famous prawn noodles shops, something could be cloying and unbearable for the tastebuds. For the Big Prawn Noodle, every sip of the soup was well-balanced to provide the diner a pleasant experience, we slurped up the last drop of the soup and with complete satisfaction. 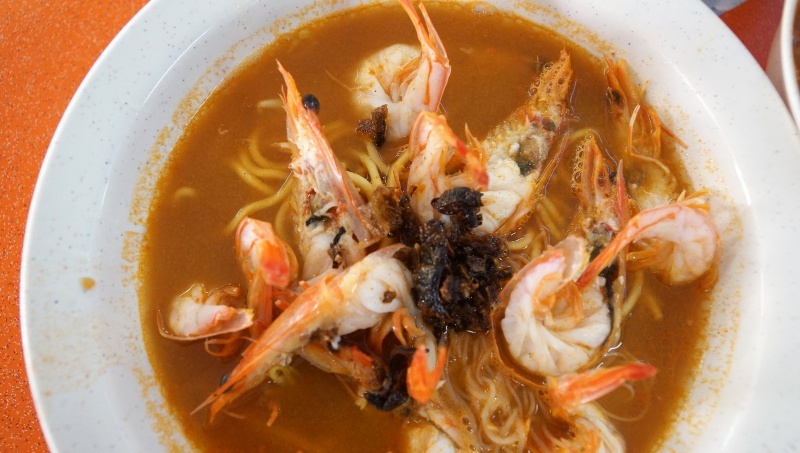 The prawns were fresh and perfectly cooked, likewise, the yellow noodle and the mee hoon. 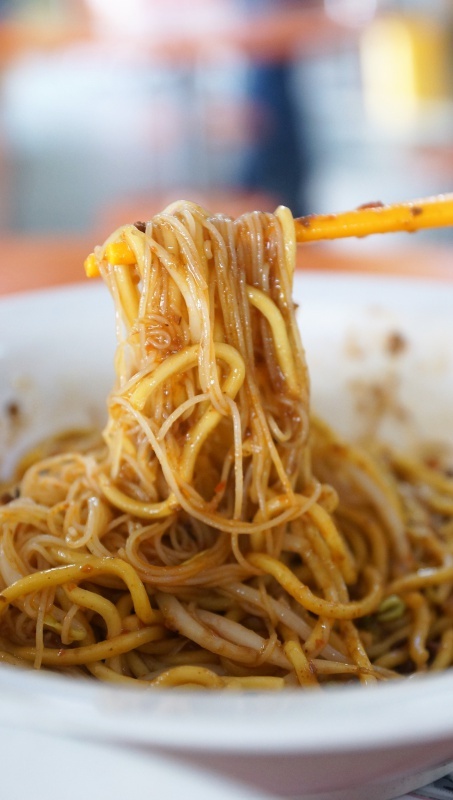 We opted for the dry version for this dish, the base chili sauce went well to give the noodles the much needed flavour, although a bit more kick in the seasoning could turn the dish heavenly. 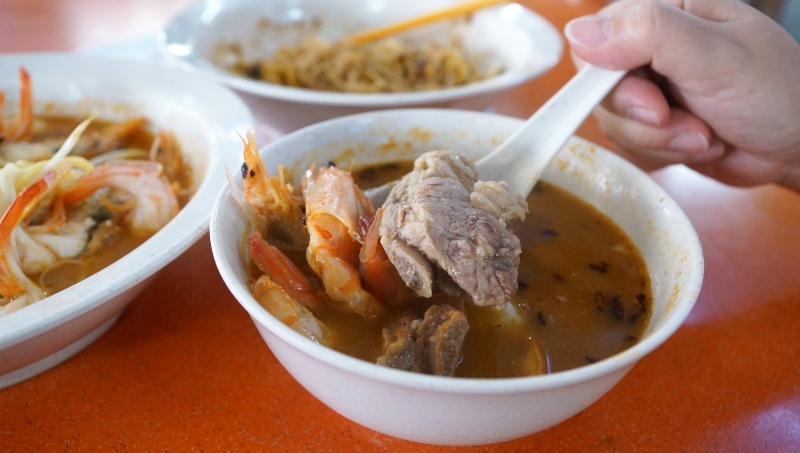 Both the yellow noodle and mee hoon mixture were cooked to the right texture, pork ribs and prawns were served in a separate bowl. The pork ribs were fork-tender, prawns were fresh and sweet. Interestingly, somehow the broth for the dry version was slightly richer and sweeter when compared to the soup version. Might be the extra pork ribs that helped to elevate the flavour in the soup. Don’t discard the spoonful of homemade shallot oil, it is the one that can help to enhance the overall taste drastically. Side orders are available too, you can top up with extra ingredients eg. pork ribs, pig skin or intestine for a cost. As for the Abalone Prawn noodles, we shall try in our next visit. 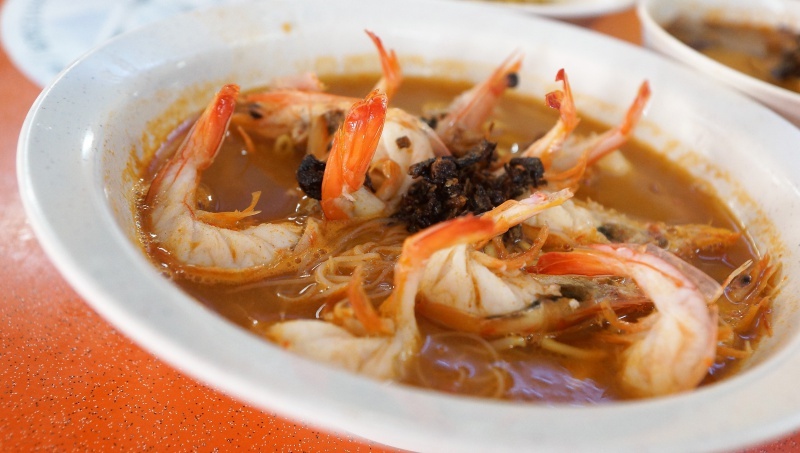 Undoubtedly, Big Prawn Noodles has well showcased its flair for the prawn noodles, “The Art of Prawn Noodles” has truly lived up to its name, delivering tantalising bowls of prawn noodles that are good enough to render them to be one of the best prawn noodles in Singapore.